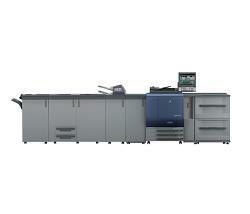 Get digital color printing with high-quality press performance and color fidelity with the bizhub PRESS C7000/C7000P. These color devices offer professional grade reliability and they reproduce even the smallest detail with razor sharp precision. Whether you’re printing a simple corporate newsletter, a full-color saddle stitched catalog or thousands of direct mail flyers with variable data, the C7000/C7000P can handle just about anything. Integrating state-of-the art technologies with streamlined digital operations, the C7000/C7000P guarantees maximum output no matter what the project. PK-512 Punch Kit (for FS-612 and FS-531): Adds 2/3 page hole punching capability. PI-502 Post Inserter (for FS-612 and FS-531): Easily add pre-printed covers to documents post-process. LS-505 Large Capacity Stacker: Stacker for up to 5,000 sheets of 80 gsm paper, with rollaway cart. LC-501 Cart (for LS-505): Move print-output safely and easily. FS-521 100-sheet Stapler/Stacker Finisher: A production finisher with 100-sheet stapling and 3,000 sheet stacking capacity. RU-509 Relay Unit: Cools prints to ensure reliable finishing and is equipped with Copy Density Control (CDC) sensors. Also houses the optional HM-102 Paper Humidifier which conditions paper stock to prevent curling. RU-506 Relay Unit (for GP-501): Reverses sheets for proper alignment in the GP-501 GBC Multi-Hole Punch Unit. PF-602 6,000-Sheet Paper Feed Unit: A high capacity paper feed unit that accommodates up to 6,000 sheets of 80 gsm paper. LU-202 2,500-Sheet Paper Feed Unit: A high capacity paper feed unit that accommodates up to 2,500 sheets of 80 gsm paper. HT-503 Dehumidifier Heater (for LU-202): Removes excess moisture from substrates to ensure reliable throughput. GP-501 GBC Multi-Hole Punch Unit: Punches holes in letter-sized sheets from 6 selectable dies. HD-514 Optional Hard Drive Unit: 6 x 160 GB hard drive kit for use as memory overflow in copy and scan modes as well as for job control with Konica Minolta IC-601 Image Controller. IC-306 Fiery Image Controller: Offers upgraded functions of Fiery System 9 and Fiery Driver 4.0 for both Windows and Mac environments.